Your locks may look healthy in front of the mirror, but think again. Your hair might be sending you some subtle signs that it’s in extreme need of your tender loving care. Clueless of these signs? Then here are five common signs that you might have an unhealthy hair. 1. Extreme Hair Loss. Losing about a hundred hair strands every day is a sign that your hair is healthy. By losing this much hair, your scalp is able to regenerate new hair strands. But it’s another story if you’re shedding much hair than that. Excessive hair loss is a sign of an unhealthy hair that may be caused by too much stress or a symptom of a medical condition, so it would be best to talk it out with your doctor. 2. Hair Strand Breaks Easily. One good sign that you have a healthy and elastic hair is that you’re able to stretch your strands like a rubber band without breaking it. But if your hair tends to break easily, then you’d have to stay away from too much heat, poor diet and hair brushes, especially when your strands are wet. 3. Strands Get Tangled Easily. Do you always find yourself freeing your brush from tangles of hair? 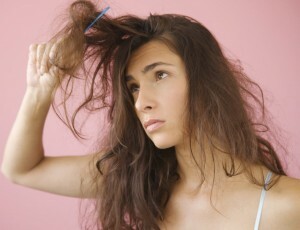 If so, then it’s a clear sign that your shafts are dry and unhealthy, causing your strands to snag easily. If you have a hair that’s smooth from the shafts to the ends, then you don’t need to put up a fight to detangle or just to comb it. 4. Hair Sticks Out on Rainy Days. One clear sign of healthy hair is having a tamed hair even on the rainy days. Regardless of your hair type, our tresses love moisture, which is why humidity shouldn’t result to a bad hair day. If you constantly experience hair frizz, then perform a double check on your hair products as they might not be the right product for your hair. 5. Itchy Scalp. Healthy hair is only achievable by having a healthy scalp. So if you’re suffering from scalp dryness and flaking, it could only mean that you’re not washing your scalp enough or you’re using the wrong type of shampoo. Don’t worry though, as this flaky problem can be easily remedied by properly caring for your scalp and using the right product. The hair is every woman’s crowning glory, which is why it’s important that you take good care of your strands. Use the right product, live a healthy lifestyle and watch how lovely your locks can become.